Six Room, Six Thousand Dollar Suburban House. A design by Armstrong for a six room home. The design incorporates many features that he'd already used and others that he would come to use even more extensively. The flat gable end with the symmetrical windows divided by a heavily carved element is quite similar to the window details on his Monday Club. The brick masonry wall extending out into the garden to begin to architectural define the spaces surrounding the house. Such walls were regular features of Armstrong's project for many years to come. They are almost always drawing as planters and often were built that way. Unfortunately, some of them have been filled in and capped to prevent excess water infiltration. The wall is particularly suggestive of a similar wall he designed for the Cori House (1935). The entry door has a diamond shaped ornamental texture which appears to be quite similar to the one ultimately used on the Cori House. The twin octogonal brick masonry chimneys are a strong visual element that Armstrong proposed in many projects of this era (the early 1930s). Its unclear whether a version of this design was ever constructed. 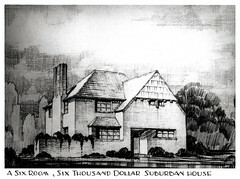 project: Proposed Six Room, Six Thousand Dollar Suburban House (unbuilt), c. 1932. For more on Saint Louis modern architect Harris Armstrong, check my blog architectural ruminations.